We often get asked about the IP ratings of pillars and cabinets, in this post, we discuss the IP ratings and also how different design elements affect the different levels of protection. IP ratings allow manufacturers to define objectively the protection an enclosure provides for the ingress of solids and liquids. It avoids simply stating that an enclosure is ‘dustproof and waterproof’ and adheres to an agreed international standard. IP rating allows users to make informed decisions about what performance their electrical enclosures need to provide to adequately protect the electrical equipment inside the enclosure. The standard EN 60529:1992 (BS EN 60529:1992) establishes a classification system and defines test criteria for manufacturers and industry to follow. How do louvre vents affect IP rating? There are many elements that may affect the way an electrical enclosure is sealed from the ingress of solids and liquids. The enclosure’s design: shape, hinges used, gaskets that seal around the door and the body, etc. A design feature of an enclosure may be its sloped roof which can prevent the build-up of dust and debris or avoid water collection in certain environments. 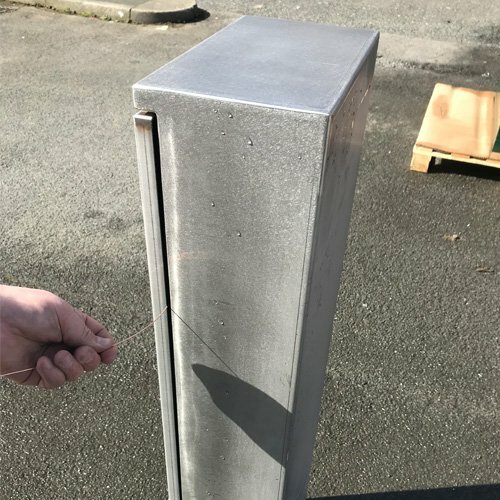 As manufacturers of outdoor electrical enclosures, we use louvre vents in our pillars and cabinets to provide a source of ventilation for the heat that can build up and reduce potential condensation. The internal temperature can rise due to sun exposure and from heat generated by the electrical equipment itself. Louvres can be a simple, passive method of controlling heat and moisture. We wanted to know how well the hinged pillars and cabinets perform without the louvres, so we decided to test the enclosures and share those results. Naturally, louvre vents are present to provide ventilation and this will mean a lower protection against dust and water. Thus the IP rating will be lower but by how much? We didn’t just want to describe our results, that’s what the IP rating is for! RH pillars and RB cabinets have louvres fitted on the doors. This means that the IP can be rated up to 2 for solid ingress (protection against ingress of fingers). 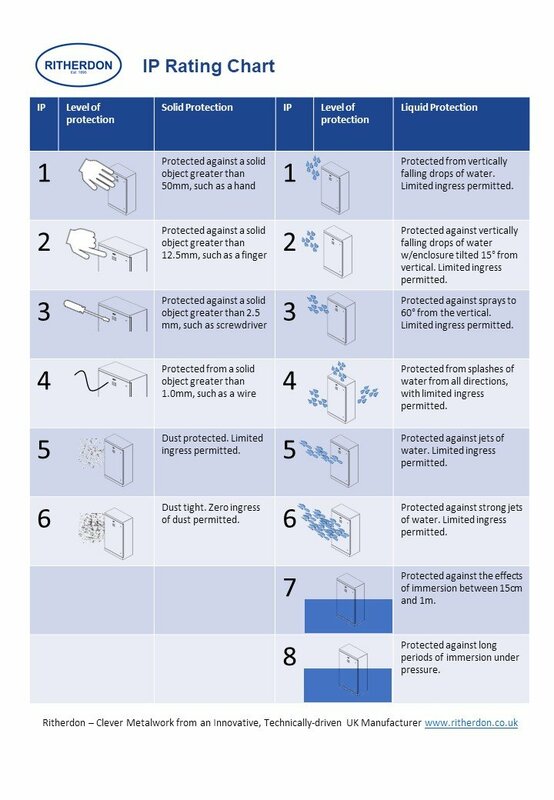 IP rating for water ingress protection is 4, protected from splashes of water with limited ingress allowed. The rating is IP 24. We had our RH Pillars and RB cabinets independently tested at Bassefa. We wanted to know how well the hinged pillars and cabinets perform without the louvres. So, we decided to test the enclosures in-house according to the standard and the test criteria defined in the IP standard, EN 60529:1992 (BS EN 60529:1992). For test purposes we used pillars and cabinets with louvres then sealed the louvres up. The aim of the test was to reach an IP of 46. For the first numeral, we can only test to ingress level 4 as higher levels require testing in a dust chamber. Our cabinets do provide dust protection, however, we cannot state an IP up to 6X for our enclosures until we have our enclosures tested in a dust chamber. The first test for the ingress of solids achieved the desired rating of 4X, meaning that the pillars and cabinets are protected from any solids greater than 1mm diameter from entering. 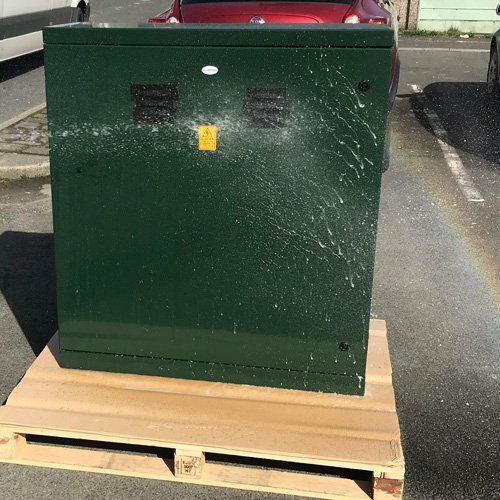 The second test is for protection against the ingress of water, with the hinged pillars and cabinets achieving an IP X6, meaning that the inside of the enclosure is protected from water entering when it is sprayed with high-pressure jets of waters from all directions. The highest protection from water ingress is 6 as the enclosures are not designed to higher levels of protection of IP X8, that include immersion. We have no intention of placing our enclosures underwater! 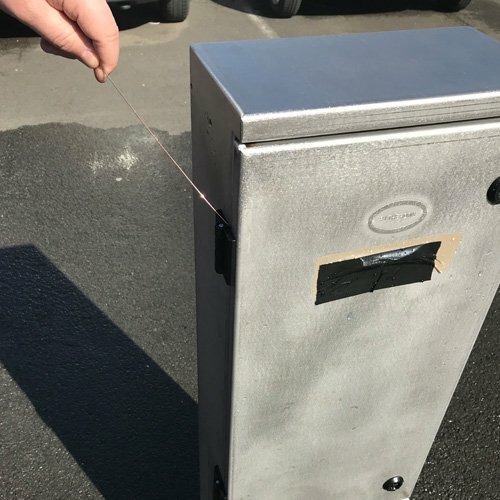 According to the tests we performed, Ritherdon hinged pillars and cabinets without louvres present anywhere on the enclosure would achieve an IP 46 defined as protection from the ingress of small objects and there is no water ingress. We’re satisfied with the performance of the RH pillars and the RB cabinets with and without louvres present. In both instances, they provide adequate protection for an outdoor enclosure. 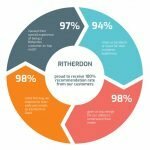 We strive to improve our products all the time and we have decided to provide the RH pillar range with no louvres as standard and provide louvres as optional. We believe the IP of 46 is adequate for most applications. Our RB cabinets will still include louvres but these will be placed on the sides of the cabinet and not on the doors. We believe that for larger cabinets ventilation is an advantage and will include the louvres as standard. 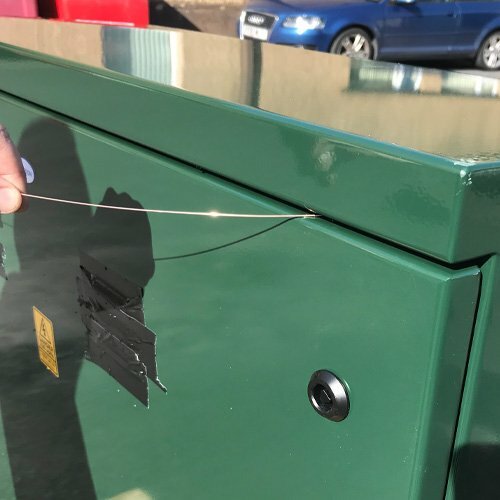 Please feel free to discuss the protection that your equipment requires with us and we’ll be happy to advise on our range of pillars and cabinets. Highest level of protection against foreign objects (not tested for ingress of dust). IP 2X Protection from solids greater than 1 mm particles and ingress of fingers. Protection from high-pressure jets of water with limited ingress permitted. Total IP 24 Protection from water sprayed at low angles from all directions. 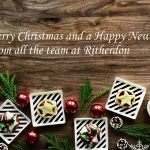 Ritherdon design and manufacture external electrical enclosures and have been doing so for over 120 years. You can be confident that we design and manufacture to stringent standards and that our products will perform the way we say they will. We don’t make claims that we can’t back up with testing.